Brush the olive oil all over the edges of the naan. 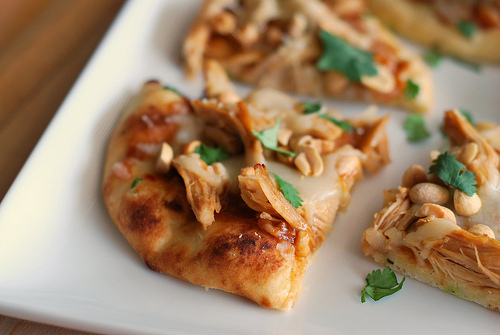 Spread the peanut dipping sauce on each naan. Top with the mozzarella and cooked chicken. Bake for 5 to 8 minutes, until the cheese is melted and the edges are golden brown. Remove from the oven, top with cilantro and roasted peanuts.